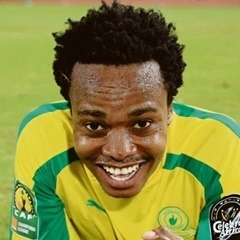 Johannesburg - Percy Tau’s stardom on the continent is growing in leaps and bounds. Despite Mamelodi Sundowns failing to defend their CAF Champions League crown, two of the Brazilians have been recognised by the continental body. From teams knocked out in the quarterfinals, Tau and Denis Onyango are two of only three players to make the CAF Champions League team. The third one is Espérance Sportive de Tunis’ striker Taha Yassine Khenissi. The Sundowns duo are also representing the other side of the equator as the team is mostly made up of north Africans, bar the two. As expected, finalists – Wydad Athletic Club and Al-Ahly – dominate the list with five players. Newly crowned champions Wydad of Morocco, who lifted their second Champions League trophy, lead with three players following their triumph over the Egyptian giants last weekend. And just like Sundowns, Ahly, the eight-time champions, also have two representatives on the list. The list is completed by three players from clubs that were knocked out in the semis – Étoile Sportive du Sahel of Tunisia and Algeria’s USM Alger. The inclusion of Tau further demonstrates the potential he has and that his contribution has not gone unnoticed. The 23-year-old featured in 10 games for the Brazilians and was a constant thorn in the side of his opponents. He is fast making his name on the continent and is the only South African to be nominated for the CAF footballer of the year award. Tau is also on the list for the African player of the year (based in Africa) award. Tau, who scored on his debut for Bafana against Guinea-Bissau in March, was also on the scoresheet against Nigeria and Burkina Faso. The pint-size striker is also a nominee for the South African sports star of the year award, alongside athletes Wayde van Niekerk and Caster Semenya, long jumper Luvo Manyonga and boxer Zolani Tete. But he is not the only PSL-based player gunning for the African Player of the Year (based in Africa) award. His Sundowns team-mate Onyango is looking to defend the crown he lifted last year after helping Pitso Mosimane’s side win the Champions League. He also helped Uganda to push Egypt all the way in the 2018 World Cup qualifiers until the penultimate round of fixtures. SuperSport United captain Dean Furman and striker Jeremy Brockie are also nominees for the African player of the year (based in Africa) award after helping their club reach the CAF Confederation Cup final. They meet TP Mazembe in the final. Brockie is the top scorer in the competition with 10 goals.